GraphLab’s SFrame, an interesting and somewhat under-the-radar tool was unveiled1 at Strata Santa Clara. It is a disk-based, flat table representation that extends GraphLab to tabular data. With the addition of SFrame, users can leverage GraphLab’s many algorithms on data stored as either graphs or tables. More importantly SFrame increases GraphLab’s coverage of the data science workflow: it allows users with terabyte-sized datasets to clean their data and create new features directly within GraphLab (SFrame performance can scale linearly with the number of available cores). SFrame is part of GraphLab Create2, a Python package due out in March3, that simplifies the creation of scalable analytic products (e.g. Recommenders and Graph Analytics). With GraphLab Create, users will be able to build and maintain analytic pipelines from within Python or IPython4 (“GraphLab Notebook”), and deploy them on single servers or across clusters, both locally or in the Cloud. In the past GraphLab was regarded as scalable and fast, but hard to use and limited in scope. Over the past several months, the startup GraphLab, Inc. has tackled both problems head on and the resulting tools should greatly increase GraphLab’s appeal among data scientists5. Integration with IPython opens up GraphLab’s fast and scalable analytics modules to the PyData community (“Build an end-to-end recommender in six lines of Python”). SFrame and GraphLab Create expand GraphLab’s coverage of the data science workflow to include data wrangling and ingestion. 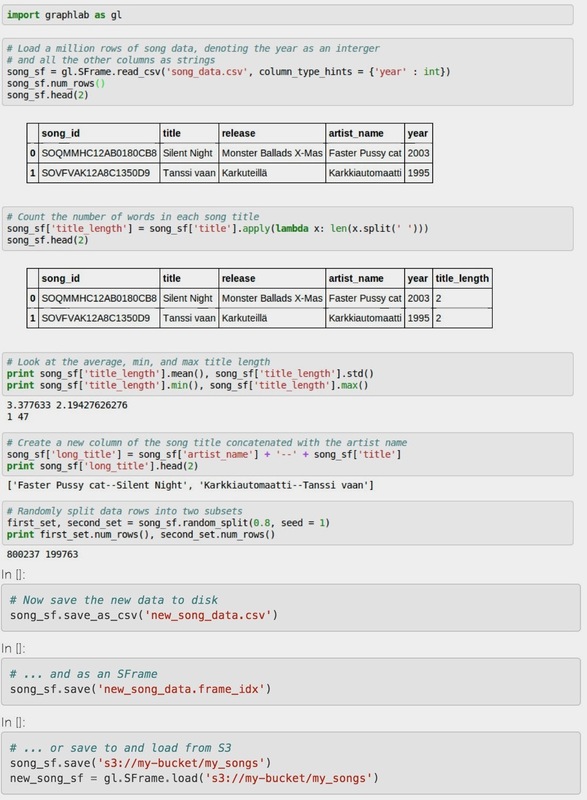 Since SFrames are similar to Pandas (PyData) and R dataframes, data scientists can very quickly be productive with them. What intrigued several Strata attendees I spoke with was its ability to scale to large data sets: SFrame lets users wrangle very large tabular datasets without being limited to in-memory size constraints (reminiscent of the efficiency of the GraphChi project). If you’re interested in trying out SFrames and GraphLab’s many graph analytic tools and machine learning algorithms, sign-up for the GraphLab Create beta. (1) Alice Zheng mentioned SFrame in her talk, and Carlos Guestrin showed it in action in his tutorial. (2) GraphLab Create is currently not open source. (3) This will be a beta release and expect more tools and features to come in the near future. The founders of GraphLab, Inc. told me they are building tools that will “… extend the value of GraphLab across the entire data science pipeline”. (5) As I noted in a recent post, Python is very popular among data scientists.